The Marketing Association of Credit Unions (MACU) presented the 22nd annual Achievement In Marketing Excellence (AIME) Awards to credit unions and suppliers across Canada during a gala dinner at the 2012 Strategic Marketing Conference in Niagara Falls, Ontario. 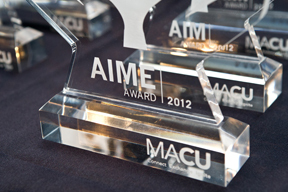 The AIME Awards recognize the best and brightest achievements in marketing, advertising and communications, and highlight the amazing talent that exists within the credit union system. The awards are rated on a point system and entries must achieve a score of 85 or higher to win. Entries were submitted in various categories including: $3,000 Shoe String; Annual Reports; Co-ordinated Campaigns; Corporate Communications; Direct Marketing / Direct Mail; Electronic Marketing; Image Enhancement; New Product Launch; Newsletters; Posters & Pop; Print Media; Radio; Special Events; Television; Website; and Best in Show. Congratulations to Bergengren Credit Union and Credit Union Atlantic! Bergengren Credit Union won the AIME Award in the New Product Launch category for its Youth Community Council Launch; and Credit Union Atlantic won the AIME Award in the Direct Marketing / Direct Mail category for its Online Banking Campaign.